The Merchants Fund has been providing financial assistance to a variety of Merchants in Philadelphia since 1854. Their goal is to boost the local economy by helping businesses make money, save money or change the way a company does business. After several years with a website that was a little on the older side including an inability to easily update content, it was time to refresh. 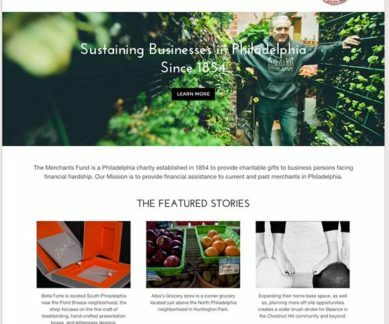 The new website built on WordPress CMS breathes fresh life into the brand and really helps to demonstrate the generous contributions it gives to local businesses throughout the Philadelphia area.